The section of Spenard Road snaking between Northern Lights and Benson boulevards is home to an eclectic collection of local retailers and eateries: House of Hobbies, Pizza Olympia, a pot shop and outdoor gear store REI. Now, just around the corner from a bar with free popcorn and shuffleboard, there's a brand-new baby food store and manufacturing facility. Bambino's Baby Food is for parents who, by nature or necessity, are attuned to their children's every mouthful — even the cookies are low-sugar, with the touch of sweetness coming from carrots and oranges. There are products for the gluten-intolerant, those who keep kosher, those with allergies to eggs, peanuts, dairy or soy, or "somebody self-aware enough to want that purity," said owner Zoi Maroudas-Tziolas. But feeding kids a regular diet of fresh, organic, varied, homemade food without preservatives or allergens requires planning, time and energy that many parents don't have. That's where Maroudas-Tziolas has found her market niche. She recognizes that although the food is for youngsters, parents are the real customers. "When you have little ones, you know they have these pure little bodies that you want to nurture," said Maroudas-Tziolas, who has two children of her own. The shop, with a kitchen in the back, is meant to evoke home. It's cheerily lit, with hand-carved wood furniture in the spacious entry room. 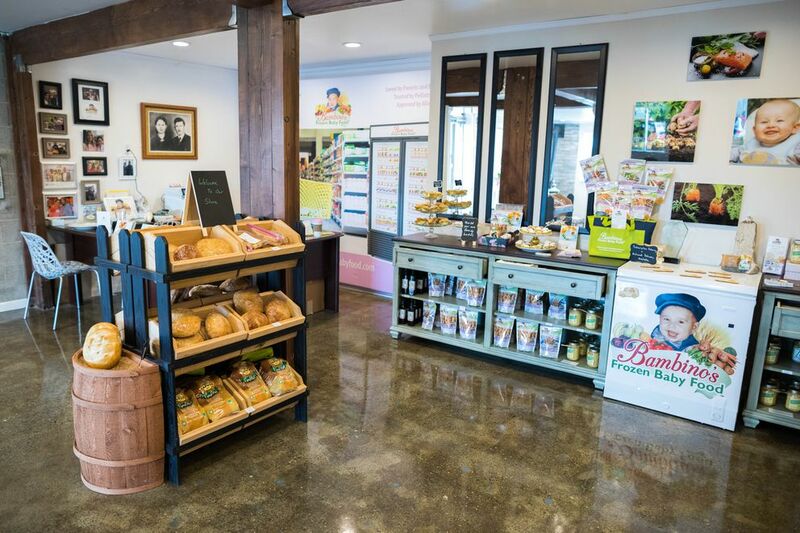 Breads, Italian cookies and other products are neatly arrayed on distressed wood shelves near a freezer full of meals made with Alaska seafood and organic local vegetables. Rempel Family Farm in Palmer is a major supplier. Customers who are so inclined can see right into the kitchen and watch as the food is being made. 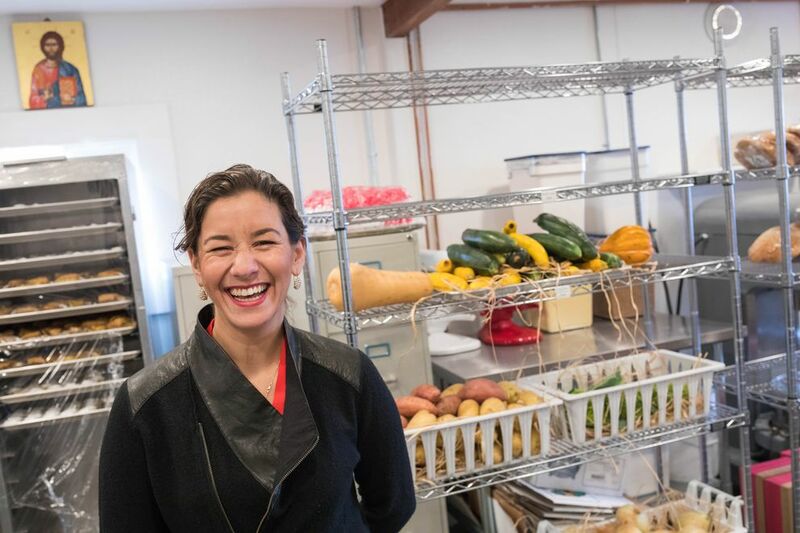 "Most of our clients make their own baby food, have spent time to go out and pick the best produce, and that sets the bar for us ultra-high," she said. "With this transparency in manufacturing, we want to be able to take our guests into the journey." Bambino's Baby Food began as a series of experiments in the kitchen of neighboring Pizza Olympia, owned by Maroudas-Tziolas' parents. Bambino's spread into Anchorage farmers markets and picked up customers in all 50 states before becoming a brick-and-mortar reality. The building's grand opening was on Friday. She chose "bambino," the Italian word for child, because it's a word most people recognize. "As my mother has instilled in me, 'You were always somebody's bambino.'" Most of Bambino's customers live outside Alaska and have found the business through their pediatricians and allergists, parenting blogs and media coverage. Maroudas-Tziolas appeared on "Today Show" radio with host Hoda Kotb last year. Maroudas-Tziolas said she didn't originally intend to set up shop near her parents. She spent two years looking for a location, with deals on two buildings falling through, before landing next to the Buckaroo Club on the corner of Spenard and Benson. The location in a major restaurant and retail corridor seems solid, save for the road work blocking access to the store. But Maroudas-Tziolas doesn't seem to mind. "How great to rejuvenate and rehabilitate Spenard," she said. "A beautiful revitalizing is coming." Jeannette Lee Falsey is a former reporter for Alaska Dispatch News. She left the ADN in 2017.